Always has been, always will be. 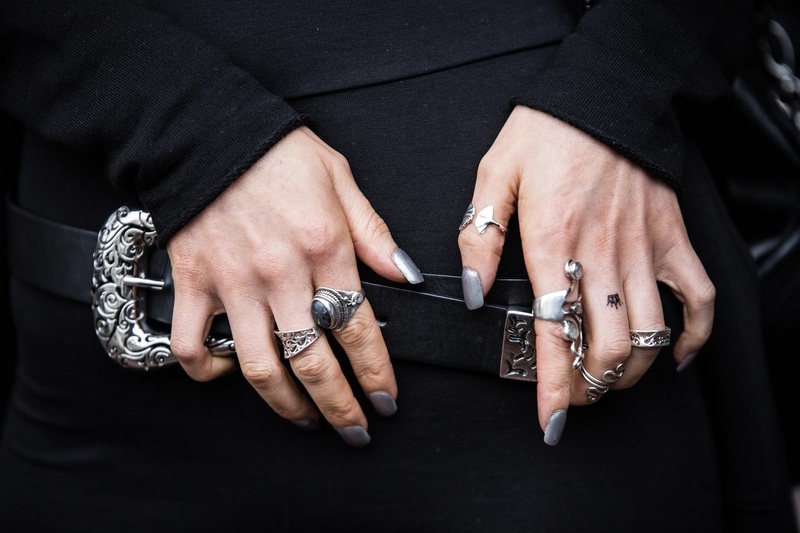 I have so much silver jewellery, It's probably a problem I should address but for now I'll take you through my 'every-day rings' and by that I mean if I don't wear these everyday I feel naked and confused about life - not cool. 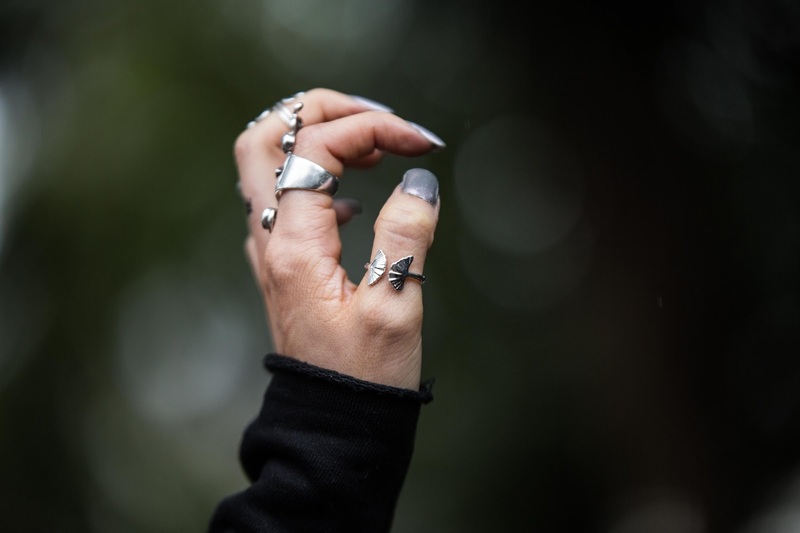 All my daily rings have been collected over time, my newest addition being the Ginkgo Adjustable Leaves - a ring out of many that has made a home on my thumb. Designed by Nature very kindly gifted me with one of their pieces because they instantly knew it was a piece that could easily be loved by anyone! It's a one size fits all beauty and deliciously compliments my skin.. I love that silver looks very fresh and clean. You can have silver, or SILVER and Designed by Nature definitely use the finest materials and have such a beautiful range of hand-crafted delicates. Right up my street! With such a range, I know I need more and will be wearing this one for years to come, let me know if there is anything you like on their website, I'd love to see! One of my favourite pieces is 'the folk' on my first finger. A ring that my mum bought me a few christmas's ago and is a ring that is made out of a folk by a local jeweller in my home town of Birmingham. They don't have an online store (I check with her every year - she's not into all of that techo-larky) all I can mention is that they are located every christmas in Birmingham's Christmas German Market. The lady is there every year and she always wears a top hat and look's rad as fuq. You can't miss her... P.s I'm sorry and I hope you find her. My Moonstoned ring is a beaut, right? This one is from my boyfriend, you can find them all the time on eBay - just make sure it's sterling and not just 'silver' - you don't want green fingers, right? The ring that's sitting nicely beside it is a ring my mum gave me - and by gave me I mean, I found it by routing through her old stuff and told myself she wouldn't even miss it. It's good to ask your auntie, gran, whoever if they have any old jewellery lying around in boxes etc.. This one was very dull and old; I gave it a good scrub and shine and have been wearing it ever since - and yes, my mum now knows and no I didn't give it back - Caring is sharing and all that. Other little additions include weekend market stools in St Kilda, Victoria or Portobello Market in London. There are also lots online stores but always do your research; I can't stress this enough - read feedback. I've bought some rubbish silver online, it can be really annoying when even though it's sterling, it bends. And there we have it.. Ok, admittedly this isn't it, I do have a few more favourites that aren't featured but only because I want to save a few for a whole jewellery post! For now, tell me about your jewellery! What's your go to pieces? and once again, thank you Designed by Nature - you are definitely for keeps!